mr b had to go to the vet today. 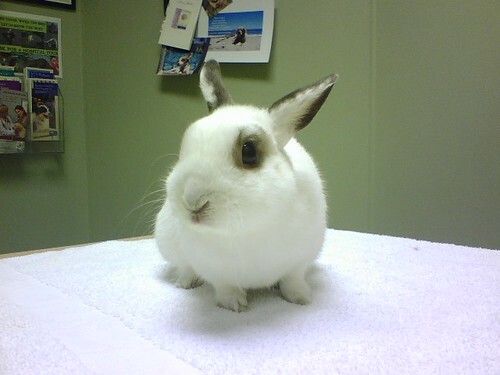 he has a bunny cold or some-such other nasty thing that's making him sneezy. we're trying antibiotics first, especially since he was such a little squirm and the vet techs couldn't keep him still to draw blood. 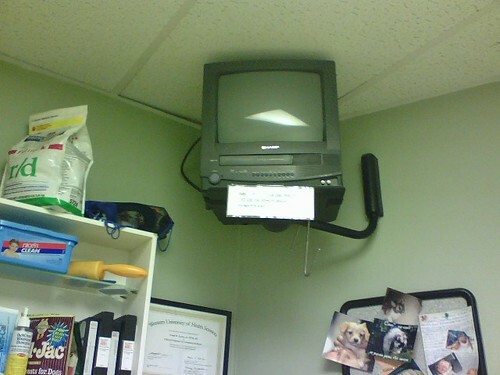 although the waits are longer and the bills are higher on the more expensive side of town, they do put televisions in all the exam rooms with remotes and notes telling you to tune in to whatever you please! Poor little guy! But a great picture. I can practically see a thought balloon: "Get me out of here!" hehe, tmjackson, so right, he seems to be thinking just that! It's funny how pets act when they are the vet. They look so miserable. Poor things. Oh adorable! I hope he is feeling much better soon. Sick bunnies are very sad. The bunny is adorable. Thanks so much for stopping by my blog.